Excerpted from, "Share with Us, Waterford, Virginia's African-American Experience", a booklet written by Bronwen and John Souders for the Waterford Foundation. Slavery put a tremendous strain on the social fabric of the African-American community. Even black residents of Waterford who had long been free could not entirely escape from the effects of that dismal institution. For many, the family was the all-important refuge from the poverty, illness, abuse and hopelessness that were their lot. 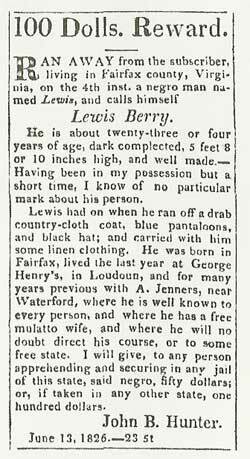 Unhappily, the harsh realities of slavery led all too often to the breakdown of normal family life in Waterford, as in the rest of the South. 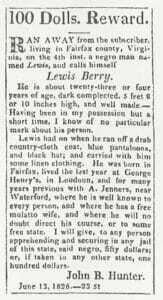 Lewis Berry's experience (See the newspaper advertisement) was not unusual. For those more fortunate, the bonds of family grew very strong. The ties forged in those hard times are evident today among the descendants of Waterford's early African-Americans. 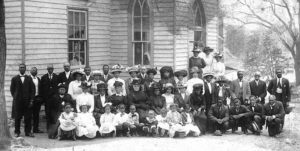 The second refuge for Waterford's black community was the church. After the Civil War, African Americans began to dream and plan for a proper church of their own. They enlisted the help of the white community. During the past three years. I have found warm friends among all classes and denominations, both white and colored. The Baptists have shown their respect, regardless of color or class. The Presbyterians are kind to the poor everywhere. 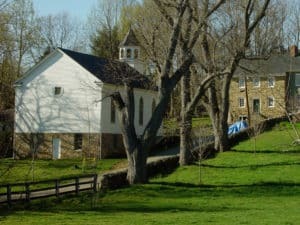 The Quakers were strange to me at first, but after living in a town among them, I found them to be "Friends" indeed to the poor colored people and thus worthy of their name. 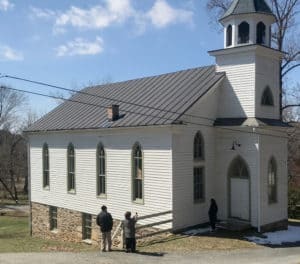 In 1891, having scrimped and saved and prayed for the occasion for a number of years, members of Waterford's black Methodist Episcopal Church congregation dedicated their new John Wesley ME Church. They had purchased the site of an old log stable to build this Gothic-revival church for their growing congregation. Before then for many years, members had squeezed into the small school on Second Street for their services and other gatherings. The men did much of the construction work themselves. Descendants remember the women holding lanterns for the men working late into the night after their day jobs to complete the work and then holding ice cream socials "for years!" to pay off the debt. John Wesley's minister rotated from his Waterford congregation to those of Lovettsville, Hamilton and Hillsboro. As Waterford s black population dwindled in the last half of the 20th century, it became harder to keep the church going. Services finally ceased in the 1960s and for many years the dignified old building remained largely empty. In 1999, former members of the congregation and their children formed a partnership with the Waterford Foundation to restore the building and rekindle memories of the village's African-American heritage. The first phase of that work began in 2001, with the assistance of generous grants from the Commonwealth of Virginia and a private donor. During a preliminary examination, workmen were delighted to discover the old church bell safe amid decades of debris that had collected at the base of the belfry. Town residents look forward to hearing it peal again to mark important events in the life of the village.